The company is expected to bring 550 positions, an increase of 20% of its present area workforce, to its new headquarters offices in early 2021. Puma North American will be the anchor tenant at 455 Grand Union Blvd. at Assembly Row. 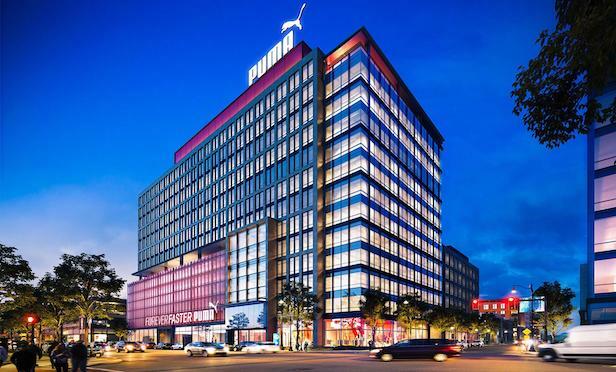 SOMERVILLE, MA—Puma North America reports it is consolidating offices in Boston and Westford, MA into 150,000 square feet of space at an office building currently under construction at Federal Realty Investment Trust’s Assembly Row development here. The fully-leased building is the closest privately-owned laboratory/office building to Harvard University and is situated within walking distance of the Massachusetts Institute of Technology. Demand is not only from e-commerce, but also for oil patch and construction firms seeking to serve the growing 16 million population within 200 miles of Houston as well as the global energy industry.